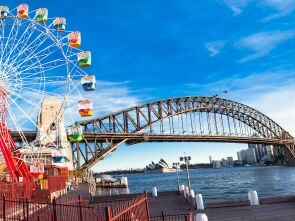 Sydney's great climate and its friendly, relaxed atmosphere make this beautiful city an ideal holiday destination choice for gay travellers. Of course, Sydney is world famous for its annual Mardi Gras Festival, but this eclectic city and its surrounds has a large number of year-round experiences on offer. The gay scene is mostly located around Oxford Street in the suburb of Darlinghurst, just a short walk from the downtown. However in recent years Newtown, located on the south western edge of the downtown, has rapidly become an alternative centre of gay life with its vibrant bar and restaurant scene. For those wishing to explore the countryside close to and around Sydney, the World Heritage listed Blue Mountains and the Hunter Valley Wine Country, both a two hour drive from Sydney, are a great "bush" experience. Sydney is not the only place in New South Wales that welcomes the gay community. Overseas visitors lucky enough to get to Byron Bay can relax in this "laid back" sub-tropical village.